These beautiful little tartlets are packed full of flavour and intrigue. We made these last Christmas as our mom was keen for us to make something to impress, and they were a hit! *This recipe makes 9 tartlets. 1. Preheat the oven to 180°C/gas mark 4. Line nine holes of a 12-hole muffin tin with paper cases. 2. Place the onion, carrot, parsnip, sweet potato and thyme sprigs on a large baking tray, drizzle with the oil and a pinch of salt and pepper and toss to coat. Roast in the oven for 25 minutes, until soft. 3. Meanwhile, place all the base ingredients in a blender or food processor and blend until smooth. You will have to scrape down the sides to ensure that everything blends evenly. Divide the base mixture between the lined holes in the muffin tin, pressing down firmly so that the base only covers about one-third of the case (any spare base mixture can be used to make energy balls). 4. Next, make the spinach pesto. Rinse the food processor and blend all the pesto ingredients until smooth. The pesto should be a wonderfully festive bright green colour. Season to taste with a pinch of salt and pepper. 5. To make the cranberry sauce, put all the sauce ingredients in a saucepan and set on a high heat. Bring to the boil, then reduce to a simmer for 5 minutes, stirring regularly to prevent the sauce from burning. The cranberries will naturally pop and give a nice texture to the sauce. Set aside to cool and thicken. 6. To layer up, add 2 tablespoons of the spinach pesto on top of each base. Next, add a layer of the roasted veg (you might not need to use all the veg) and finish with a spoonful of cranberry sauce. Garnish with some fresh thyme leaves and serve on a festive platter. 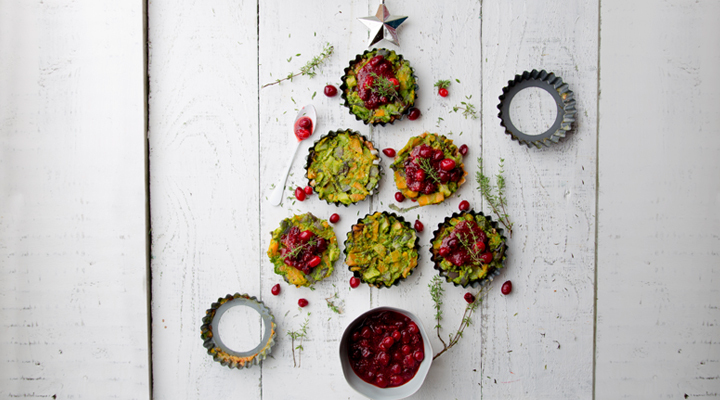 Tip: Any extra roasted veg makes a great side to these beautiful tartlets.